I am pleased to apply for the position of the account executive at (name of the corporation/company). I have a previous experience of working as an account executive in (name of the company). I have worked there for (number of years). I have had formidable education in (name of the degree/subject). Thus, I feel confident in my abilities. I consider myself to be fully capable of performing this role at (name of the company). 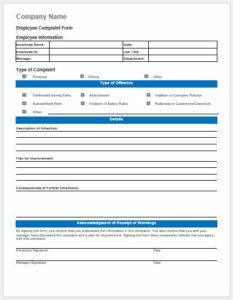 My responsibilities while working at (name of the company) included working with account planners and creating campaigns, invoicing, working with the creative team on advertisements and meeting up with clients and determining their advertising needs. Moreover, I managed the client’s accounts and presented ideas and costs to them. I always keep the satisfaction of my client a priority therefore, I quickly try to resolve any issue in the best way possible. I constantly strive to maintain a healthy and friendly environment all the time. I have received my degree in (name of the subject) from (name of the institution). The education I have received has served to be the foundation for my abilities. I have 2 degrees one is bachelors in business and the other in marketing. I have studied statistics, media, advertising, communication, marketing, psychology, and business management. The acquisition of these skills has proved to be very beneficial to me. These skills have played an extremely important role throughout my career as an account executive. I have grown into a polished and knowledgeable individual during my college as well as my professional career. My love for advertising world has also grown with time. This love has made me passionate about this field. This passion has fueled my drive through hard times. It has provided me with the much-required strength and perseverance both at school and at work. In the last I would like to thank you for considering my application for the post of an account executive at (name of the company). I am looking forward to hearing more about your company as well as about the position. 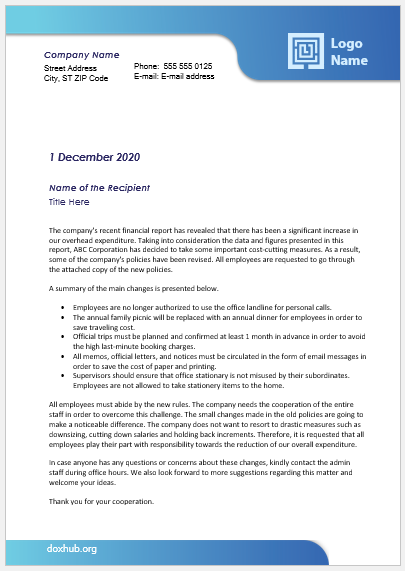 Without taking much of your time I would like to conclude my letter by saying that my previous experience of (number of years) in (name of the company), in addition to the vast knowledge I have, makes me the best suitable candidate for the post. I assure you that if you select me for the position of account executive, I would do my job with passion and complete honesty. 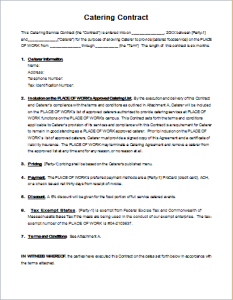 It is a pleasure for me to apply for the post of Account Executive at (Name of the company). My formidable education along with my experience makes me confident in my abilities to perform this role of Account Executive at (name of the company). During my previous job at (name of the institution) I had number of different responsibilities. I was responsible for meeting with the clients for determining their advertising needs, working with the creative team on several advertisements, invoicing and working with the account planners for creating campaigns. I also managed the accounts of my clients and presented them with ideas and costs. I always kept the satisfaction of my clients as my priority therefore, I quickly tried to resolve any conflicts that arose. I am a person who takes pride in his work and strive to maintain a friendly environment. I always deal my clients professionally. I consider my education at (name of the university) to be the sole foundation for my abilities. I did bachelors in business as well as in marketing from (name of the university). During my academic career, I was fortunate enough to study marketing, advertising, communication, statistics, psychology, media, and business management. The acquisition of all these skills has helped me throughout the course of my professional career as an account executive at (name of the company). I always had a love for the advertising world in my heart and that has helped me in growing into a polished and knowledgeable individual. My passion for the advertising world has always fueled my drive through hard times. Moreover, it has blessed me with strength and perseverance both at school and at work. I would like to thank you for taking out time and considering my application for the post of Account Executive at (name of the company). I cannot thank you enough for this. I have always liked your company and it would be an honor for me to work in your advertising team. 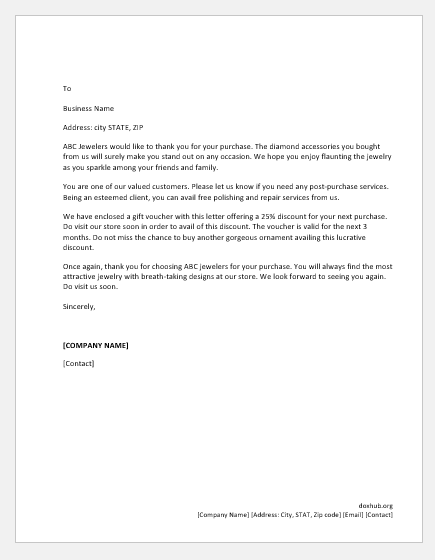 I am looking forward to hearing more from you regarding the company as well as the responsibilities that your advertising team has. 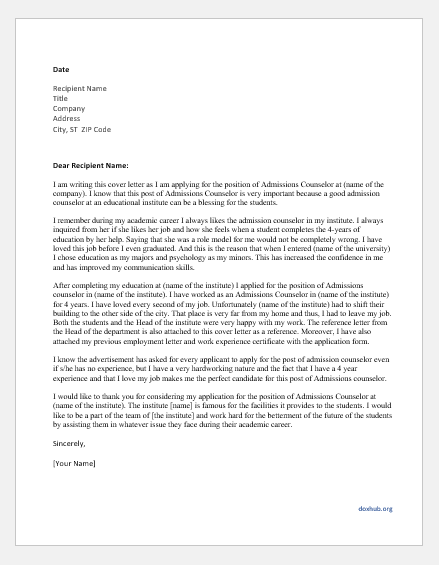 I would like to conclude my letter by saying that I feel confident that I am the best candidate for the position of Account Executive due to my education and my past experience at (name of the company). 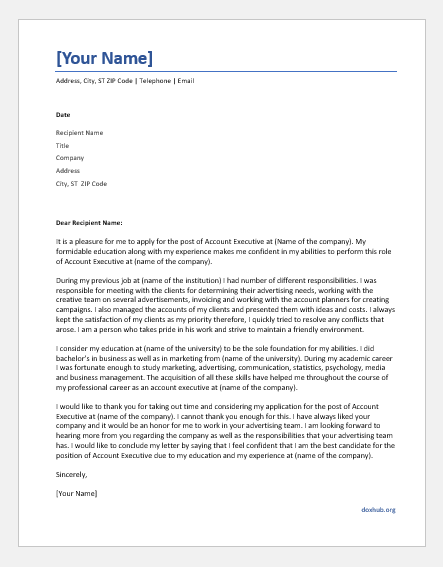 I feel pleasure in applying at your company (name of the company) for the position of Account Executive. 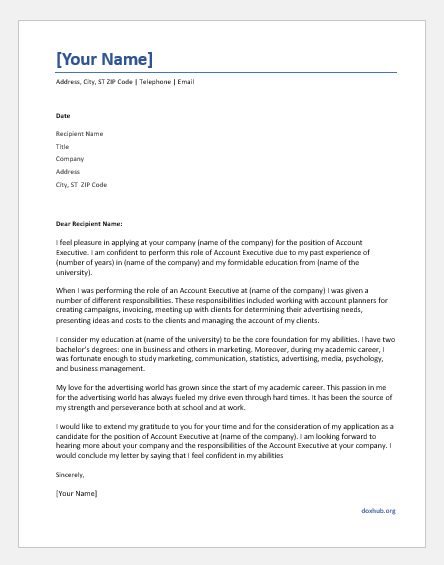 I am confident to perform this role of Account Executive due to my past experience of (number of years) in (name of the company) and my formidable education from (name of the university). When I was performing the role of an Account Executive at (name of the company) I was given a number of different responsibilities. These responsibilities included working with account planners for creating campaigns, invoicing, meeting up with clients for determining their advertising needs, presenting ideas and costs to the clients and managing the account of my clients. 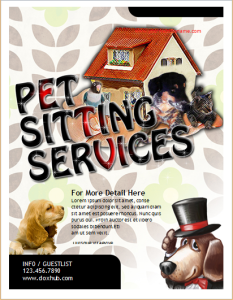 Moreover, I worked with the creative team on several advertisements. I, during my previous job, have always tried to resolve every issue or conflict efficiently and quickly. I always prioritize the satisfaction of my clients. I am a person who takes pride in his work; therefore, I constantly strive to maintain a healthy and professional environment all the time. I consider my education at (name of the university) to be the core foundation for my abilities. I have two bachelor degrees: one in business and others in marketing. Moreover, during my academic career, I was fortunate enough to study marketing, communication, statistics, advertising, media, psychology, and business management. The study of all these subjects has proven to be very beneficial for me as by studying these subjects I have improved my skills and abilities. These acquired skills are very important for my career as an Account Executive. Over the course of my academic and professional career, I have grown into a polished and knowledgeable individual. My love for the advertising world has grown since the start of my academic career. This passion in me for the advertising world has always fueled my drive even through hard times. It has been the source of my strength and perseverance both at school and at work. 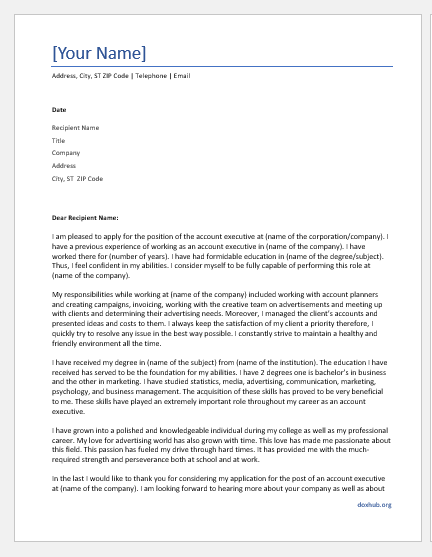 I would like to extend my gratitude to you for your time and for the consideration of my application as a candidate for the position of Account Executive at (name of the company). I am looking forward to hearing more about your company and the responsibilities of the Account Executive at your company. I would conclude my letter by saying that I feel confident in my abilities to perform as an Account Executive at your company. My education and my experience makes me the best suitable candidate for the job.